The possible detonation of a radiological dispersal device or improvised nuclear device in a metropolitan city, or the accidental exposures to a radiation source, nuclear accidents, or the all-to-often threats of radiological/nuclear terrorism have led to the urgent need to develop essential analytic tools to assess such radiation exposures, especially radiation doses to exposed individuals. This exposure-assessing work using biological samples, and discipline, is known as biodosimetry. As of late, this field has progressed significantly as it has made use of the advances within newer areas of biologic analytics, namely omics (genomics, proteomics, metabolomics, and transcriptomics), lymphocyte kinetics, optically stimulated luminescence, and electron paramagnetic resonance technology in addition to conventional cytogenetic techniques. The use of automated high throughput platforms and the planning for laboratory surge capacity during the time of need are the latest developments in the field of biomarkers for biodosimetry. Such biomarkers are also needed for radiation exposure/dose conversion estimates that are essential for the development and application of radiation countermeasures, from animals to humans and that are currently being developed following the US Food and Drug Administration Animal Rule. 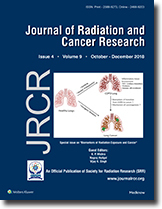 Here, we present and discuss the current status of various biomarkers for assessing radiation dose after radiation exposure. It is anticipated that with the advent of improved biomarkers and associated biomarker platforms for the acute radiation syndrome, exposed victims can be more efficiently triaged and appropriately treated than is currently allowable. The latest advances in the field, and identify the areas where improvement is needed are also listed and discussed. Cancer cells display a higher level of reactive oxygen species (ROS) mainly due to increased metabolic activities resulting in altered redox balance. Imbalance in redox arises when the generation of ROS exceeds antioxidants defense system. ROS are generated in cells from multiple pathways, but mitochondria contribute significantly to cellular ROS pool by oxidative phosphorylation. Elevated levels of ROS are implicated in cell transformation, proliferation, and tumorigenesis. ROS-mediated signaling pathways activate pro-oncogenes which regulate cancer progression, angiogenesis, and survival. Normal cells maintain intracellular homeostasis by developing an array of enzymatic antioxidant systems such as catalase, superoxide dismutase, and glutathione peroxidase. Chemotherapy and radiotherapy exert their cytotoxic effects on tumor cells by the generation of excessive ROS. The failure of therapies is attributable to a small fraction of core cells in tumor mass called cancer stem cells (CSCs) which have self-renewal property and exhibit proliferation, differentiation, and resistance to treatments. Both normal and CSCs maintain low-ROS level ascribed to stemness. This review describes role and relevance of ROS in CSC with particular emphasis on developing predictive biomarker for outcome of cancer radiotherapy. It is pointed out that CSCs maintain lower ROS homeostasis and evade cell death by increased level of endogenous antioxidants capacity in cancer cells. Search for regulators of ROS and surface markers in CSC may render them sensitive to radiation offering new and effective strategy for cancer treatment. Breast cancer remains a clinical problem despite advancements in the field. Cancer stem cells (CSCs) within the breast cancer population are implicated in cancer relapse. The dormant CSCs generally resist available treatment, thus challenging the current treatment paradigm. Radiation is an aggressive form of treatment typically used to reduce tumor mass in breast cancer patients. Several clinical and research-based studies have shown that radiation treatment cannot target all cancer cells, leaving behind radioresistant cells. The radioresistant cells have the potential to acquire stem cell-like features that render them untargetable with respect to the current technology. This review elaborates on cancer cells acquiring stem cell phenotype. In addition, we discuss the phenotype and function of cancer cells that are derived from radioresistant cells as well as indirect changes as a consequence to bystander effect. In addition, the epigenetic profile of the radioresistant cells plays a crucial role in the acquisition of cycling quiescence and stem cell-like phenotype and is detailed in this review. According to the World Health Organization (2016), chronic obstructive pulmonary disease (COPD) and lung cancer (along with trachea and bronchial cancers) are third and sixth among 10 top causes of death globally. The association between lung cancer and COPD has been widely established owing to their common endogenous and exogenous risk factors. 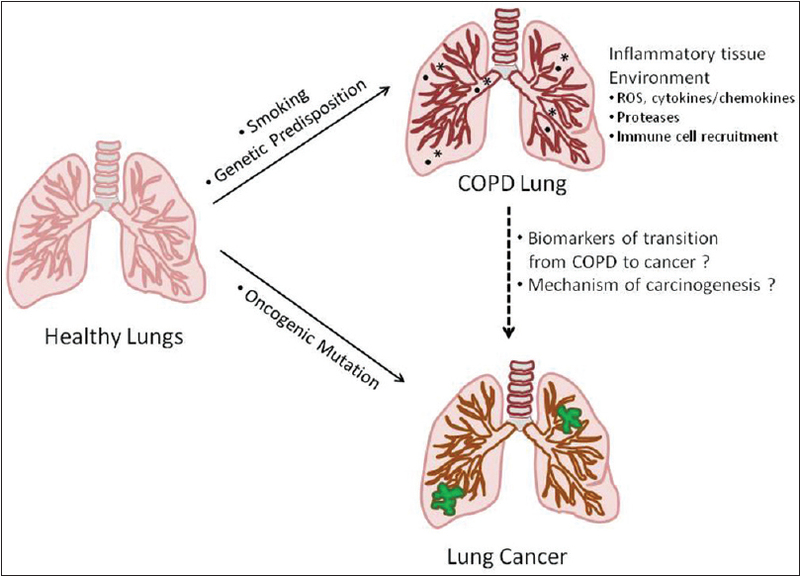 Mechanistically, lung cancer and COPD are interlinked diseases in many ways such as oxidative stress-associated DNA damage, inflammation, and telomere shortening. An increase in lung cancer has been well correlated with smoking, which is likely to occur up to five folds higher in smokers with COPD than normal lung function subjects. In majority of cases, lung cancer development, especially in COPD patients, is asymptomatic and only diagnosed at advanced stages with poor prognosis. The development of biomarkers for early prediction of lung cancer in both high- and low-risk COPD patients will help clinicians for their better follow-up, early diagnosis, and improved therapeutic management. Annual public exposure from background radiation is about 2.8 mSv which comes from both natural and manmade sources. The medical applications of ionizing radiation contribute around 98% of the manmade sources of background radiation. 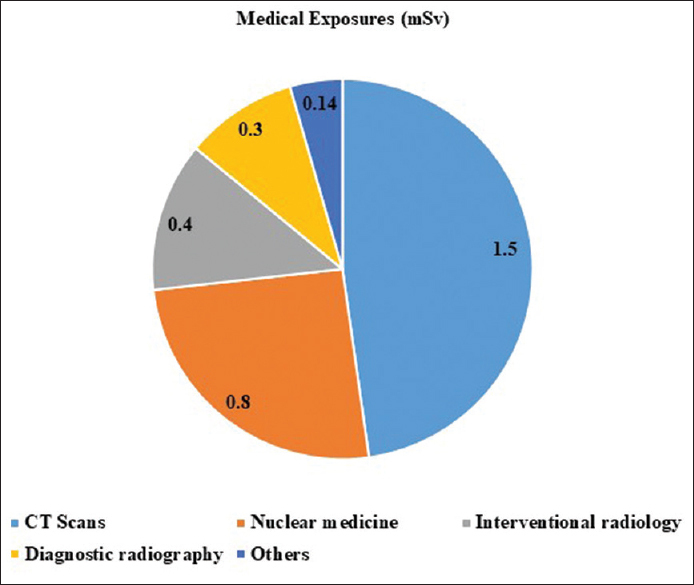 The annual per caput dose rose from 0.35 to 0.62 mSv by the worldwide usage of radiation diagnostic examinations. Based on the published reports, the diagnostic examinations – computed tomography (CT) scan and cerebral angiography are high (7.4 mSv and 9.3 mSv, respectively) in the average effective dose. In our study, we measured the entrance surface dose at different anatomical locations using thermoluminescence dosimeter in patients who underwent CT examinations and neurointerventional radiology procedures. The measured dose values range between 0.70 and 518.12 mGy for CT and 0.99 and 777.31 mGy for interventional procedures. Thus, X-radiation based procedures delivered a considerable amount of radiation dose to the patients. To minimize the risks of developing any health effects, safety measures should be taken to reduce the dose without compromising the image quality.